"A willing pig must go look for food in the forest in Christmas time"
Mrs. Piggly is the mother of some little piglets that need to be fed. As a good mother, she would do anything to make her piglets grow up fine, strong and healthy. For that, she will have to go out over the forest and gather what her piglets need the most: apples. These apples won't be easy to obtain. The forest has many different animals that will try to take them from you. In Piggly Christmas Edition, you will have to fight, be fast and think clearly if you want to survive and bring the apples to your piglets. 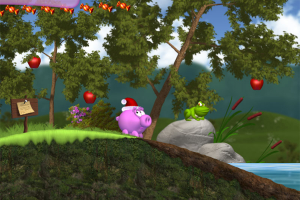 Piggly Christmas Edition is the Christmas release of this fun game with an original story. Some colorful graphics decorated especially for Christmas and many surprises will make you have a good time while playing this game. You will go over 32 levels in order to finish the game, and overcome 7 bonus ones that you will also find. Gather parts of a secret apple recipe to bake the best meal. Find secret areas that the game has for you and collect 16 types of sweets to create a sugar rush. There is an original soundtrack created specially for the game that you will enjoy while living some adventures with Mrs. Piggly.